You love spending time with your family over the holidays, especially since you get a break from work as well. The only frustrating aspect of this time of the year is all the financial planning that you have to do. Between the gifts and the decorations for your home, you can really lose track of how much you’re spending this holiday season. The Holiday Budget Sheet is the best tool for monitoring your spending this year. You don’t have to break the bank during the holidays; you have everything you need to enjoy this time, once you download this free template! Start by clicking on the link located at the bottom of this page to download the template for free! Once open, you can begin to customize your document to fit all of your holiday shopping needs. Enter the total amount you want to spend during for the holidays in the “Budget” column at the top of your page. This will allow the template to calculate all of your expenses and subtracted from your budget. The next step to customize your template is to list the various forms of revenue to have a more precise breakdown of your budget. This information will be entered into the green table at the center of the page. Just as you did with the green table, you will fill out the red table with your expenses, instead of income types. You can add or change any of the pre-written examples by clicking inside the cell and typing your new information. Both the red and the green table will give you a total at the end of each section, however, more comprehensive calculations of your income and expenses will be displayed in the table at the top of the page. The template will also give you a balance, so you know if you are over or under budget! 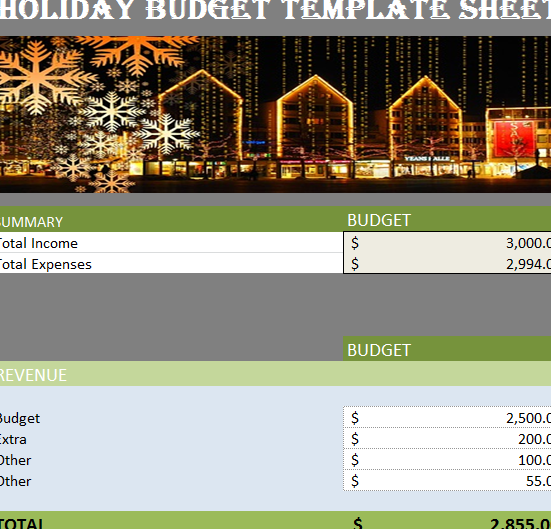 Make your holiday budget as simple and easy as possible with this convenient template! Create your own budget for all your holiday shopping this year!